We can restore, replace or renew high performance wooden sash windows, using any timber and fully painted to a colour of your choice. Restoring your old sash windows will give you effective noise reduction and heat retention, without having to replace them with new windows. Inserting a draught weather pile can enable the sash to slide up and down again with increased ease, and with restoration complete, this will make it a pleasure to open and close your old windows. Restored sash windows will therefore actually operate better than the originals due to the installation of a draught weather pile. Restoring old sash windows will make them look ‘good as new’ and have great curb appeal, giving them a new lease of life. However, if your windows are beyond repair, and restoration is not an option, replacement sash windows can be made and fitted into the original frames, with all rotten timber removed and replaced, like for like, reinstating the original design. Plastic windows consume a lot of energy in their production, and most are only expected to last 20 years. When broken, most go to land-fills, as parts are impossible to repair as opposed to wooden windows that have lasted over 100 years. Installation. To ensure dust is kept to a minimum we block necessary doorways and stairwells and cover all furniture that hasn’t been removed from the room. Having work done in your home or work space can sometimes be an inconvenience, even when the result is worthwhile, therefore our working practices aim to ensure minimum disruption. All areas within the properties we work in are completely covered with dust sheets, and carpets or floor coverings protected. We carry out as much of the work as possible at the workshop, or occasionally outside the property, under our gazebo, thus aiming to minimise mess and inconvenience for the customer. Conservation Areas, Technical Drawings, Design and Details. Cardiff has 27 conservation areas that have been designated for their special architecture or historic interest. If you’re not sure if you are in one of those areas, or if you need planning permission, please feel free to get in touch and we can assist you through the process, arrange a visit or schedule a survey. We can replicate original design and deal directly with the local council conservation team, providing technical drawings and measurements to ensure new custom-made sash windows meet all requirements to your geographical conservation area. We appreciate that every building is unique, therefore, replicating sash windows in different areas needs to be carried out sympathetically. Original sash windows have putty glazing which upon original installation was knifed clean at a 45 degree angle. 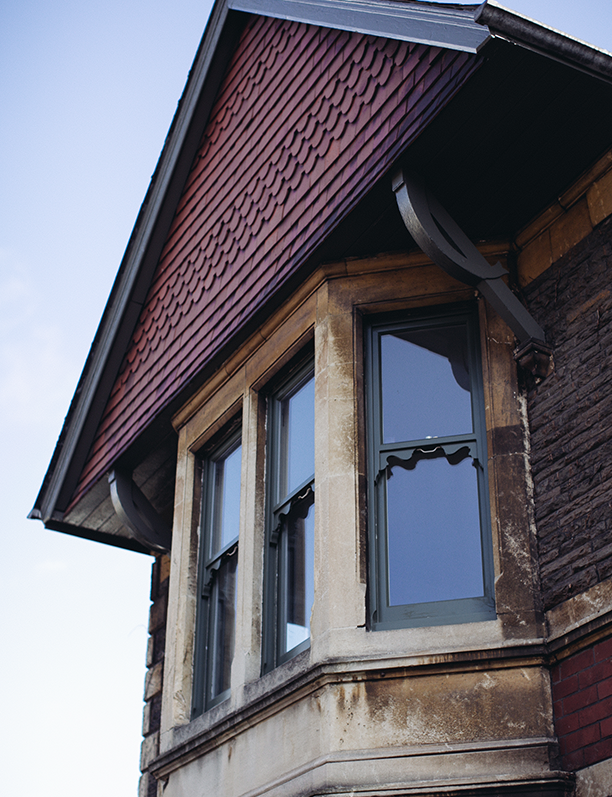 For this reason, all our new windows have chamfered sashes to match the original appearance. They’re glazed from inside using an ovolo moulded bead replicating the original for optimum security. As a mechanism for opening and closing sash windows, we can incorporate weights and cords or hidden spring balancers. We offer an extensive range of elegant ironmongery options in a selection of finishes, which, where applicable, conform to British Standards. All our new window installations meet current government guidelines on energy efficiency and building regulations on glazing safety. 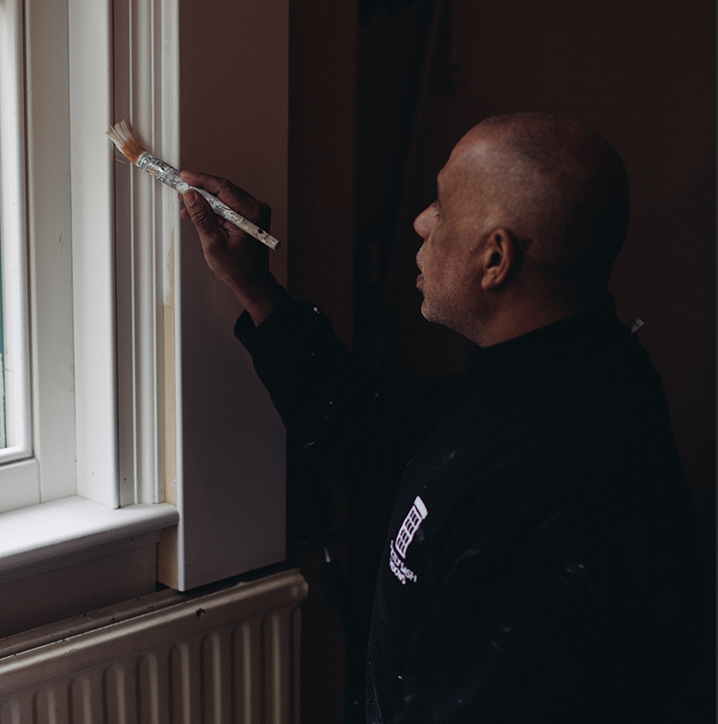 For windows that require restoration, our highly skilled decorator Wayne has over 40 years experience and is an expert when it comes to painting sash windows. 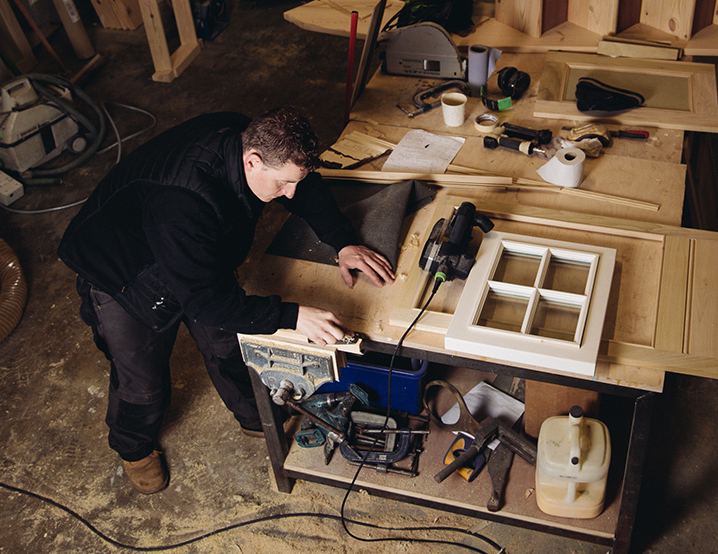 All new replacement windows we manufacture are fully sprayed on all edges before being assembled in the workshop, ensuring maximum protection from the elements once installed. A microporous paint is used, which provides excellent protection, whilst allowing the wood to breath, with minimal maintenance. Installing new windows that are already completely spray painted enables us to be able fit all windows to the front of an average Victorian house in one day! We also offer a maintenance service where we will come every 5 years to re-paint your windows for an agreed fee.